Wraps are easy and fun to make, and very versatile, as we can make use of any combination of our favourite vegetables, grains, dips and spices for the filling. 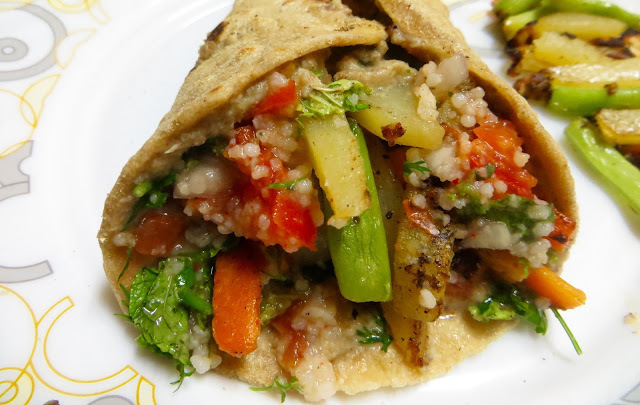 In this recipe, I have used stir-fried, mildly spiced vegetables and foxtail millets, and a peanut and dates spread along with tomato salsa in a whole wheat wrap. The peanut-dates spread adds a creamy and mildly sweet taste to the wrap. The raw onions in the salsa add a perfect crunch. A vegan, healthy recipe, with very less oil, loaded with nutrients, and a perfect after school snack for children. 1 inch chopped vegetables like carrots, beans, potatoes, broccoli, capsicum, etc. for the stir fry. In a bowl take the whole wheat flour, a little salt, and mix it. Add warm water to it slowly, mix and knead very well for 5 minutes till you get a smooth dough, as you would normally make for rotis. Set aside for 15 minutes. To cook the millets, first wash and soak them for 10 minutes. Then drain the water and add 3/4 cups water, salt to taste and pressure cook for 3 whistles. Meanwhile in a pan, dry roast the peanuts till they turn crunchy. Make sure they are not overly roasted. Remove from the pan and let it cool. In a blender, take the roasted peanuts, chopped dates, mint leaves, a pinch of salt, red chilly powder, and grind nicely. Add some water and blend to get a smooth sauce. The peanut-dates sauce is now ready. To make the salsa, mix together the chopped tomatoes, onions, chopped green chillies, cumin powder, salt, lemon juice, and coriander leaves, in a bowl, and set aside. In an iron wok, heat a tsp of oil. Add turmeric powder. Now add the chopped vegetables one by one and sauté nicely. Make sure they are cooked and yet maintain a crunch. Add salt, pepper powder, and mix well. Lastly, add the cooked millets and mix well. Now make slightly thick rotis with the whole wheat flour. For assembling, take one roti, spread the peanut dates sauce, sprinkle some salsa, and place the stir fried veggies and millet mix neatly in the middle. Wrap the roti around it, and dive in! !